The Heinkel He 116 was designed in 1936 as a long-range transport/mail plane for Lufthansa. Eight units of the first version He 116 A were delivered in 1937. The aircraft was operated by a crew of three or four, it had a length of 14.3 m (46 ft 11 in), a span of 22 m (72 ft 2 in), a height of 3.3 m (10 ft 10 in), and an empty weight of 4,020 kg (8,826 lbs). Powered by four 240-hp Hirth HM 508 H inverted-V-8, air-cooled engines, it had a maximum speed of 325 km/h (202 mph), a service ceiling of 7,600 m (24,900 ft), and a range of 3,410 km (2,120 miles). The long-range potential of the He 116 suggested to the RLM that the airplane could have some military application. 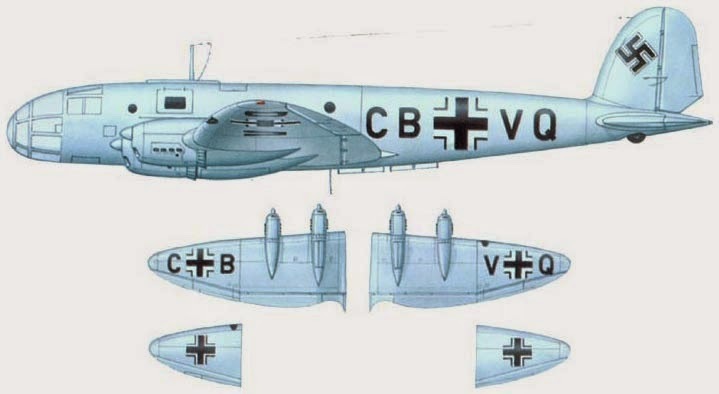 A militarized version, He 116B, was adapted with glazed nose, and six units entered Luftwaffe service in 1938. The aircraft proved disappointing however, and the Heinkel He 116Bs were confined to carrying out photographic and mapping work over Germany and German-occupied territories during World War II. V3 was removed from the line to be converted into a record-breaking prototype. The modifications included a larger 75.6 metre² (814 ft²) wing with a 25 metre (82 ft) span, and increased fuel tankage in the fuselage. The design did not need the same sort of altitude performance, so the HM 508H was installed in place of the C, with a slightly lower RPM and somewhat improved fuel economy, but only 240 hp (179 kW). The lower power and increased fuel made takeoffs difficult, so the plane, renamed the He 116R Rostock, was fitted with four RATO units. On its first test one of the rockets tore loose and hit the wing, requiring extensive repairs. After these were completed a second attempt was made on June 30, 1938, covering 9,942 km (6,178 mi) unrefueled, at an average speed of 214 km/h (133 mph). By this point the engine project had been cancelled outright, but additional orders continued with the 508s. V7 and V8 were modified for the long-range reconnaissance role with a "glass nose" similar to what would become common on most of the Luftwaffe's bomber designs. These were tested during 1938 with generally favourable results. Six additional aircraft based on the V7 pattern were then ordered, known as the He 116B-0, although they also received prototype numbers V9 through V14. The He 116Bs were intended to operate at extremely long range, outside the range of enemy fighters, and therefore fit no defensive armament. All eight (V7 through V14) were issued to reconnaissance units prior to the war, but by that time the idea of a slow-moving unarmed plane providing any useful information seemed unlikely. Instead they were used over German territory providing mapping services.